The San Onofre nuclear power plant shut down in 2012 after the replacement steam generators had serious vibrations problems due to errors in design. This also led to steam dispensing some radiation. Faced with the delay to again replace the generators, waiting for approval to run one reactor at 2/3 power, the coastal commission blocking an ocean sonic earthquake fault survey, and an intense nuclear safety protest after Fukushima, Edison decided to shut down the plant permanently. California still has two nuclear reactors at Diablo Canyon, and one of the three Palo Verde reactors out of state. So we still get 6% pollution free nuclear power. This is down from 7% in 2012 and 24% in 2011, when San Onofre was operational. This is a loss of 18% in clean nuclear. While nuclear protest organizations are happy that renewables have replaced this, the large state and federal investment in renewables was made with an intent to replace polluting coal and natural gas power, not to replace already clean nuclear power. The amount of power listed as unspecified sources is out of state power, that doesn’t have to be broken down. It could include out of state clean nuclear, solar and hydro, as well as dirty coal. This makes it impossible to give an accurate CO2 emissions profile from SC Edison. This means that all of the electric car buyers and users in our area cannot brag about how clean the power they use is from SC Edison. In 2010, unspecified was only 13%, or an eighth of total power. In 2011 it was 15%. In 2012 it soared to 41%, and in 2013 it declined to 34%, or a third of our power. California has been a leader in developing renewable power, and has all sources available. This is due to plate collisions that built up the Sierra Nevada mountains that provide rivers and dam locations to generate hydro power. The faults also provide geothermal vents, not available in most other states. The San Gabriel mountains, again a result of plate collisions, provide high wind passes to generate wind power to Southern California. The mountains also cause unoccupied deserts to the east, which allow for enormous solar cell and solar thermal facilities. 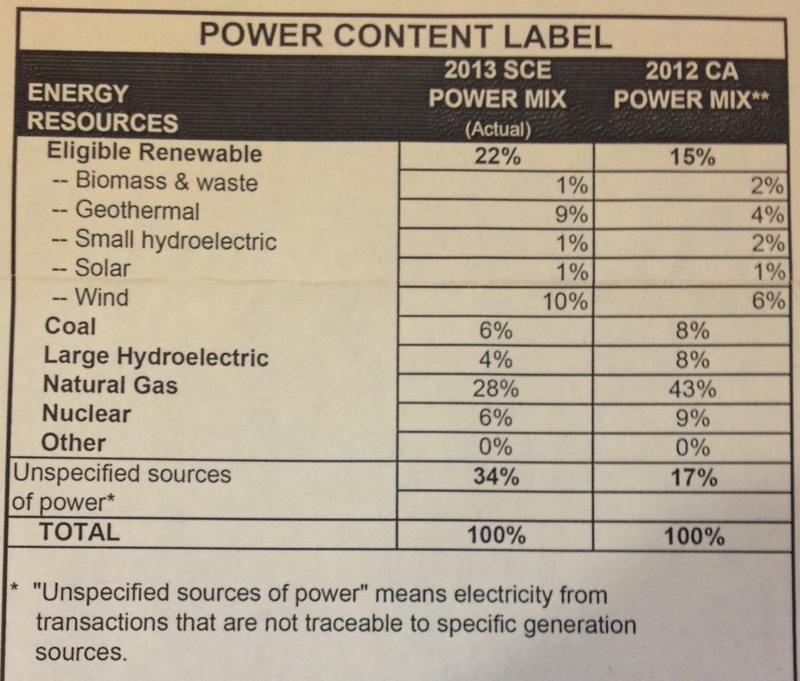 The 2013 SCE Power Mix has renewables at 22%. Geothermal is remaining steady at 9%, same as in 2012 and 2011. Wind power is at 10%, growing from 8% in 2012 and 7% in 2011. Large hydro is at 4%, where it was in 2012, having fallen from 7% in 2011. Biomass and waste, which are renewable but not pollution free, stay steady at 1%. Many people and organizations thought that new solar power would replace San Onofre nuclear power. Yet solar has remained at only 1%. Natural gas is at 28%, increasing from 21% in 2012, but almost restoring the 27% from 2011. Since we still have 6% coal, it would be nice to replace that by cheap natural gas, which only emits about half the CO2 as coal does for the same amount of electricity. The persistence of coal may be due to long range contracts. Our local Huntington Beach natural gas plant has been replaced by a new one that can vary power more rapidly to replace fluctuating wind and solar power when needed. So the main changes are the growth of natural gas by 6%, and the decline in unspecified power by 7%. These are probably related. This entry was posted in California Power Mixes, Climate Change, Fossil Fuel Energy, Nuclear Energy, Renewable Energy, San Onofre, Solar Energy, Wind Energy. Bookmark the permalink.